What Are The Chinese Astrology Dates? 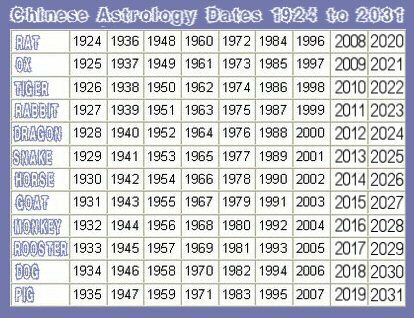 Chinese Astrology Dates of this chart show from year 1924 through to year 2031. As you can see from the years that are listed below each animal rules for one year and then the next animal has its turn. Every 12 years the cycle of Chinese Horoscope Dates begins again and you can easily determine what year is controlled by which animal whether you are researching the distant past or predicting the future. Even in Japan, their horoscopes have adopted these twelve different animals representing each twelve-year cycle of the zodiac. Have a look below to see what year and animal you are then go to the next page to read about the Traits and Characteristics of your Chinese Horoscope Signs. If you do not yet know your animal, look through this list. What does your intuition tell you? Are you a Rat? Are you an Ox? Are you a Tiger? Are you a Rabbit? Are you a Dragon? Are you a Snake? Are you a Horse? Are you a Sheep? Are you a Monkey? Are you a Rooster? Are you a Dog? Are you a Pig? - Picked one intuitively? Now check below for confirmation.